Congratulations to BobbyC and Matt for their entries in the P’s Porridge Potluck Challenge. Both completed the task within the prescribed parameters, each with an original recipe. The entries were evaluated in two parts. Primary Points were awarded objectively for meeting the prescribed project parameters. 10 Primary points were allotted for each of the five stages. Premium points were awarded based on purely subjective observations. There was no set limit on premium point allocation. 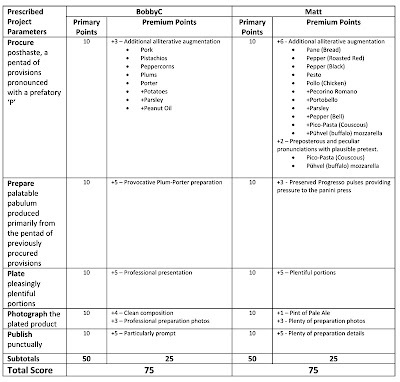 Since both entries met all prescribed project parameters, the full 10 points were earned for all five stages, or 50 Primary Points each. Premium Points were also categorized by the five stages of the task. 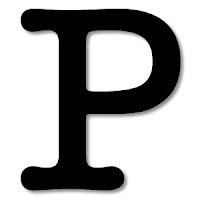 The project parameters required a minimum of 5 ingredients beginning with the letter ‘P’. One point each was awarded for each additional ‘P’ ingredient. BobbyC augmented his primary pentad with potatoes, parsley and peanut-oil. But Matt took an early lead here with a plethora of prefatory P’s, and earned extra points with some peculiar and preposterous pronunciations, even resorting the Estonian ‘Pühvel’ to qualify his buffalo mozzarella. BobbyC earned points for originality with his delicious sounding Plum-Porter sauce. In Matt’s case, I’m not sure if the can of “preserved Progresso pulses” amounted to alliterative aforethought, but I liked it just the same, so points to Matt for that. BobbyC gets premium points for a very attractive presentation with nice colors and nary a stray pistachio. This dish would not look out of place in a nice restaurant. Matt’s earned points for his mouthwatering ‘hungry-man’ portion. Forget the napkins; you’ll need a whole roll of paper towels for this sandwich. Although rules for the photography stage only required photos of the plated product, premium points for photography were awarded both for preparation photos and the final “product” shot. Overall, BobbyC’s photography earned more points for aesthetics. The composition is clean, the lighting is simple, but not harsh and the result looks very appetizing. The main technical issue is the shallow focus, particularly evident in the fuzzy fork in the final photo. I think this is an ideal excuse for BobbyC to invest in more toys tools, such as a bigger flash (to allow a smaller aperture) or a perspective control lens with tilt to finesse the plane of focus. Although not as refined in the aesthetics department, Matt earned points for plenty of illustrative, step-by-step preparation photos. Clear and instructive as they were, Matt’s photos could benefit from an off-camera flash, and some attention to details such as background clutter. BobbyC scored points here for a particularly prompt posting. The speed at which he completed all phases of the challenge is even more impressive considering that he spent a good part of the challenge period in the car. Matt also published his P’s Porridge post well before the Pluto Day deadline. But Matt appears to have taken a little extra time to round out his post with more preparation details and photos. The final points tally is shown in the table below. This was a really good showing by both BobbyC and Matt. Both of these posts have made me very hungry. Any ideas for dinner? I am puzzled by the posting of the points for the participants. I see the table for BobbyC's points, but do not see Matt's. There also is a BIG gap between the prescribed parameters table and the extra points. It was a tough competition, both meals sounded positively delicious! By the way... who won? I vote for a tie with a run-off. Yup, I messed up when transcribing the post. I'll have it fixed this morning. The scorecard has been repaired and posted. Particularly prompt posting of the particulars. I figured it had to be a tie! Now for the run-off (cook-off). The teacher in me loves the points rubric!!! The hungry girl in me loves the idea of an in-person multi-meal run-off cook-off family reunion!!! We've got plenty of room here in Pendleton!